Suffering from hysteria, Sabina Spielrein is hospitalized under the care of Dr. Carl Jung who has begun using Dr. Sigmund Freud's talking cure with some of his patients. Spielrain's psychological problems are deeply rooted in her childhood and violent father. She is highly intelligent however and hopes to be a doctor, eventually becoming a psychiatrist in her own right. The married Jung and Spielrein eventually become lovers. Jung and Freud develop an almost father-son relationship with Freud seeing the young Jung as his likely successor as the standard-bearer of his beliefs. 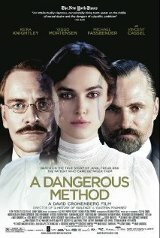 A deep rift develops between them when Jung diverges from Freud's belief that while psychoanalysis can reveal the cause of psychological problems it cannot cure the patient.